The big shakeup to the PGA tournament schedule moves the PGA Championship from it's usual late-summer date to May 2019 this year. The tournament which takes place from May 16 - 19, 2019 will be hosted - also for the first time ever - by the Black Course in Bethpage State Park on Long Island, New York. Just up ahead, check out the complete TV schedule, along with PGA Championship trivia and fun facts, and related resources for one of the biggest tournaments on the PGA calendar. US television coverage in 2019 encompasses more than 20 hours of air time including the final two rounds of the PGA Championship on CBS Sports, with additional coverage and daily highlights televised on cable channel TNT. at Bethpage is ranked as the No. 1 golf course run by a government entity - New York State Parks. This year marks the 101st edition of the PGA Championship, as thousands of golf fans line up for the hottest ticket in professional golf. That includes the deepest international field of players -- including Vijay Singh, Phil Mickelson, Padraig Harrington, Rory McIlroy and and defending 2017 champ Justin Thomas -- competing for the coveted Wanamaker Trophy with a total purse of $11 million. PGA Championship ticket prices ranging from $25 for a Monday practice round ticket to $550 for a week-long ticket package. Tickets go on sale to the general public in October 2018. • The PGA Championship trophy, one of the largest in golf, is named after department store magnate Rodman Wanamaker, himself a keen golfer and in part responsible for founding the PGA. 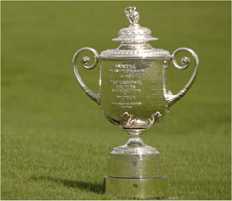 • The silver Wanamaker Trophy measures 28 inches high and 27 inches across at its widest point. It weighs 27 pounds. • Today, a replica of the Wanamaker Trophy is given to each year's winner and the original is kept at the PGA Historical Center in Port Lucie, Florida. • The purse for the first PGA Championship back in 1916 was $2,580, with $500 going to the winner. The winner’s share hit $100,000 for the first time in 1983 and $1 million for the first time in 2003. • American-born players have won 77 PGA Championships. South Africa and Australia are next with four each -- followed by Scotland, England and Fiji with two each. • In the modern era, Jack Nicklaus holds the most PGA Championship titles with five, followed by Tiger Woods with four. Elsewhere on the Web, check out top sites reporting on all the action with player profiles, interviews, video clips, picture galleries and the latest headlines as the annual PGA Championship draws near. PGA Championship - Wikipedia - Get deep background on the tournament with historical highlights and trivia, records, notable winners, dates and venues of future PGA Championships, related references and resources. BBC SPORT | Golf - Watch for classic coverage of this year's championship with the Beeb's usual top-notch video and audio reports, live updates, news features, schedule, standings, and player profiles.